Most, although not all, articles that mention my family and me are listed below. Newspaper clippings dating back to 1891 descibe milestones in my mother's family. Discovering the story of a dramatic lynching in my father's hometown. A picture album of the farm where my mother grew up in southeastern Ohio. Letters from my grandmother's brother Luther Robinson, serving as a Army butcher in World War I. When laundry day began with building a fire in the back yard. Pictures of my father and the automobile business, from the 1930s to the 1970s. My mother's career in the basketball-crazed Class of 1931 at BHS. A sketch of my Uncle Ralph's life, including his marriage and his corporate vice-presidency. Old Buckingham and Thomas photos dating from 1895 to 1978, but mostly from the 1930s. ...but maybe the reason was that everyone was doing it. I hear from the minister's grandson. As Vernon Thomas prepares to head overseas in World War II, his wife writes to her mother. Excerpts from my father's letters from Calcutta in 1944. My father's World War II experiences. Color photos from the tea-growing Assam region. My father brought home an air crew's map of the route from Chabua to Kunming. The illustrated story of my father's return from India, sailing through the Suez Canal. A few images from my first six months, including a cartoon. My family and the house where I lived from age 2 to 5. Speeches by my father: Vote, disagree but not bitterly, avoid strikes, sell the idea of giving. At the age of 5½, I show you the house where I lived for six months in Newark, Ohio. At the age of 6¼, I write to my grandmother about my stage debut and Bun's Restaurant and cookies. Memories of my churchgoing grandfather Harry Buckingham. On India's religions, the changes brought by Christianity, and a church that our family built. Pictures of the flowers that Ann Thomas grew. The illustrated diary of a three-week car trip in 1959. Driving a car used to demand much more from the feet, before the Autronic-Eye and cruise control. Our favorite dinners, including my mother's mayonnaise-free deviled eggs. The sounds of conversation, dinner, and music-making with the Thomases and my Grandmother Buckingham. Parts of conversations between my mother and her friends. Following a floor plan that I drew up, the Thomases build a new house. Click here for a picture of my grandmother and her "toothpick tree." A 1963 visit to future historical sites. My mother's recipe. Also: chicken sandwiches Richwood style. Vernon M. Thomas Chevrolet is destroyed in a spectacular blaze. With pictures. My family and I encounter Rodgers and Hammerstein musicals (through 2013) and a merry Oldsmobile. Family pictures from the 1960s. A glimpse of a storied town in northern Ohio. In Livermore, Kentucky: conversations with relatives and a church service on Mother's Day, 1972. Images from home movies of the 1973 and 1974 holidays. From Phoenix to Plains, Georgia. Escaping a blizzard, my parents and I watch a groundbreaking Daytona 500 telecast in Arizona. My father gets an official notice of his death. More travel, after my mother's death. My father dies. Later, the 35th reunion of my high school class prompts more memories of Ohio. A mysterious neighbor must look just like me. Just how unusual is my repetitive name? Fivescore folks who answer to the same name as I. My phobia about being inside tall rooms may be related to an evolutionarily acquired reflex. For the first time in 153,351 miles, I invest in a new car. I've worn glasses for 50 years. But being nearsighted has its advantages. My father's name is a part of veterans' monuments in two small towns. On my own, I take a trip to the Curtiss Museum and the Jordan firemen's site and the birthplace of Robert Ingersoll, whom I quote at length. Back in Syracuse in 2014, I report Dean Biklen's retirement, revisit where I lived, and reminisce about canine encounters. Cataract surgery clears up my vision. I return to Frankenmuth and tour Henry Ford's Greenfield Village. I follow my resolutions on eating and exercise only part of the time, watching the clock and calendar. 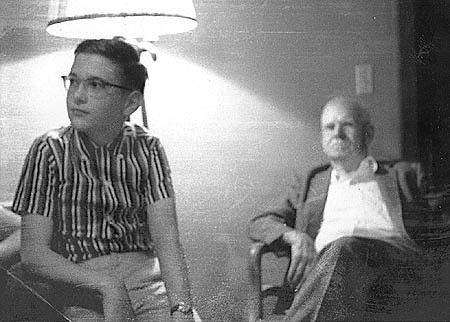 With my Grandfather Thomas at his Kentucky home, probably 1957.